Hey guys just out of curiosity what do you think the chambers of Cair Paravel would look like during the time of the Pevensies? Thinking about doing some redecorating? That's an interesting question, and it makes me really curious about the set design for Narnia on Netflix. (I've thought about what the outside of Cair Paravel should look like, but not the inside!) I've always imagined the bedrooms in Cair Paravel (especially when Eustace and Jill visit in SC) as being cozy and not overly ornate, but I don't have a clear picture in my mind. And during the Golden Era of Narnia, I bet that each of the Pevensies' bedrooms resembled their personalities. This bedroom at Hearst Castle in California is ethereal rather than cozy, but the light through those windows is lovely! I can imagine Lucy's room having similar features. 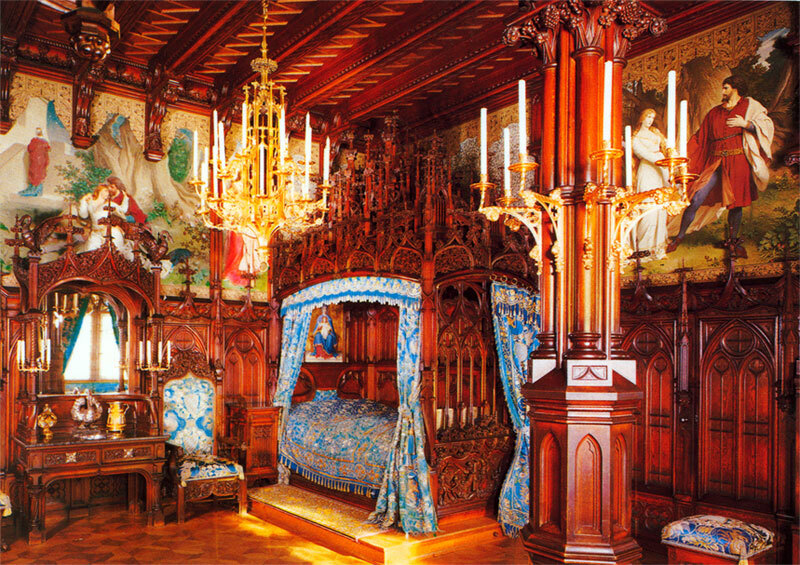 This is a bedroom in Neuschwanstein Castle in Germany, and while the woodwork is extremely ornate, I really like the colors and warm atmosphere. And can you imagine those murals on the walls depicting Narnian scenes? This might be something like Susan's room, I think.